LONG BEFORE CANNONS FIRED over Fort Sumter, civil war raged within America’s churches. Three of the nation’s largest Protestant denominations were torn apart over slavery or related issues. Before 1830, slavery was an accepted part of American life. But over the next fifteen years, it became so sharp and powerful an issue that it sawed Christian groups in two. Why? • Cotton production, which depended on slave labor, became increasingly profitable, and essential to the economy, especially in the South. 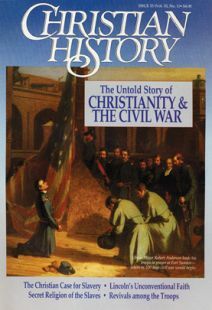 • During the 1830s, famous revivalist Charles Finney converted thousands of people, many of whom joined the crusade against slavery. • In 1831, Virginia slave Nat Turner led a violent revolt that killed 57 whites. Southerners feared deeply any attempts to free the millions of slaves surrounding them. That same year, fiery abolitionist William Lloyd Garrison began publishing “The Liberator.” His heated attacks on slavery only hardened southern attitudes. By 1837, the anti-slavery societies that had existed across the South had disappeared. Southern abolitionists fled to the North for safety. Before 1844, the Methodist Church was the largest organization in the country (not including the federal government). When it divided, a strong cord tying North and South was cut. Indeed, according to historian C.C. Goen, 94 percent of southern churches belonged to one of the three major bodies that were torn apart. Suddenly, in a religious sense, the South was set adrift from the Union. The divided churches also reshaped American Christianity. Important new denominations, such as the Southern Baptist Convention, formed. And Christianity in the South and its counterpart in the North headed in different directions. Southern believers, who had drawn on the literal words of the Bible to defend slavery, increasingly promoted the close, literal reading of scripture. Northerners, who had emphasized underlying principles of the Scriptures, such as God’s love for humanity, increasingly promoted social causes. Only nine years ago were southern and northern Presbyterians reunited. And few observers expect reunion between southern and northern (white) Baptists. American Christianity continues to feel the aftershocks of a war that ended 125 years ago. 1839: Foreign Missions Board declares neutrality on slavery. 1840: The new American Baptist anti-Slavery Convention denounces slaveholding; Baptists in South threaten to stop giving to Baptist agencies. 1845: Home Missions Board refuses to appoint a Georgia slaveholder as missionary. 1845: Alabama Baptists ask Foreign Missions Board whether a slaveholder could be appointed as missionary; northern-controlled board answers no; southerners form new, separate Southern Baptist Convention. Key leader: Francis Wayland, president of Brown University. Key stands: Refusal to appoint slaveholders as missionaries; dislike of slavery; desire for strict congregational independence. Key leaders: William B. Johnson, first president of the Convention. I.T. Tichenor, later leader of Home Mission Board. Key stands: Freedom to carry on missionary work without regard to slavery issue; freedom “to promote slavery”; desire for centralized connections among churches. 1857: Southern members (15,000) of New School become unhappy with increasing anti-slavery views and leave. Ultimately they join Old School, South. 1861: When war breaks out, the Old School splits along northern and southern lines. By 1870, divisions between Old School and New School are healed, but deep geographical divide will last for more than 100 years. Key leaders: Lyman Beecher; Nathaniel W. Taylor; Henry Boynton Smith. Key stands: Moderate interpretation of Calvinistic theology; openness to Charles Finney’s new revival techniques; openness to interdenominational alliances; inclination toward abolition. Key leaders: Archibald Alexander; Charles Hodge; Benjamin Morgan Palmer; James Henley Thornwell. Key stands: Traditional Calvinistic theology; opposition to voluntary societies (that promote, for example, temperance and abolition) because these weaken local church; opposition to abolition. 1836: anti-slavery activists present legislation at General Conference; slavery agreed to be evil but “modern abolitionism” flatly rejected. 1840: anti-slavery delegation fails to make slaveholding a discipline issue. 1843: 22 abolitionist ministers and 6,000 members leave and form new denomination—Wesleyan Methodist Church. 1844: Fierce debate at General Conference over southern bishop James O. Andrew, who owns slaves. Resolution declares he must step from post. Angered Southern delegates work out plan for peaceful separation; the following year they form Methodist Episcopal Church, South. Key leader: Orange Scott, abolitionist minister from New England, first president of Wesleyan Methodist Church. Key stands: Slaveholding a matter for church discipline; abolition. Key leader: James O. Andrew, slave-owning bishop from Georgia. (He acquired slaves through marriage and renounced rights to them, but state law prohibited his freeing slaves). Later bishop in Methodist Episcopal Church, South. Key stands: Slaveholding acceptable for church leaders; opposition to abolition.